The 3D printers using FDM (Fused Deposition Modeling) also known as FFF (Fused Filament Fabrication) is the most affordable technology for 3D printing at the moment, but the extrusion of thermoplastic material does have its limitations as well as some advantages. The most significant disadvantage that makes some people start looking to make the next step is the level of detail that the FDM/FFF printers offer, so the next step is normally to go for a 3D printer using Stereolithography (SLA) – a 3D printing technology used for producing 3D models layer by layer by curing a photo-reactive resin with a DLP or UV laser. You should be aware of the fact that the SLA 3D printing hardware is more expensive and also the resin used for building the 3D printed models is also more expensive than what you are using with an FDM/FFF 3D printer. The detail level and durability of the printed materials is usually significantly higher, but the materials you can choose from as not as much as you have in the form of various thermoplastic that can be extruded with an FDM/FFF 3D printer. If you have decided to move from an FDM/FFF 3D printer to an SLA 3D printer, or just get another 3D printer to extend your creative options, then your first step should probably be to check out the FormLabs Form 1+. It is a pretty affordable 3D printer using stereolithography technology to build 3D models with a layer resolution of up to 25 microns – 0.025 mm or 4 times better than what the usual best layer height offered by most plastic extrusion 3D printers. The drawback that the Form 1+ printer has is that the printable object size is smaller than what most FDM/FFF 3D printers offer even the most basic ones, so you will not be able to print very big models, unless of course you break them down to segments. The build volume you have available with the Form 1+ 3D printer is 125×125×165 mm and the printer does use support material where needed that is automatically generated and should be easily removable when the print is ready. One thing that people used to print with on plastic extrusion 3D printers – the leveling of the build plate is not needed, meaning less problems with unusable prints. The Form 1+ complete package will cost you $3299 USD and 1 liter of resin used by the printer is being sold of $149 USD. 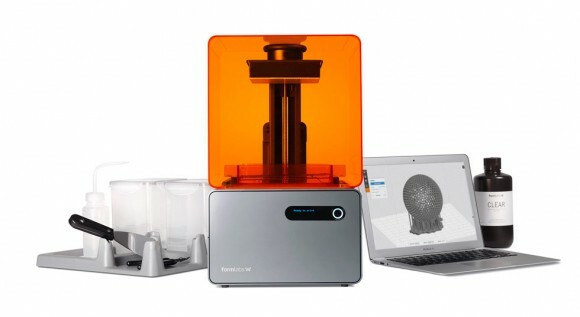 We are already considering getting a Form 1+ 3D printer for next year to accompany our MakerBot Replicator 2 FDM 3D printer in order to be able to start experimenting with SLA 3D printing.